Sit and chant (this can be any verse or mantra you feel comfortable with) while holding the cord in hand. As the power starts to build, pause from time to time to tie a knot in your cord. "By knot of one this spell's begun." Then go back to chanting until you feel it is time to tie another knot This is tied in the opposite end with the words: "By knot of two, it cometh true." Then back to the chanting. As you chant, picture what you want and take aim. So it goes, chanting and picturing then tying a knot. As the power builds, more knots are tied until there are nine knots in the cord. They are tied in a particular pattern and with appropriate words. 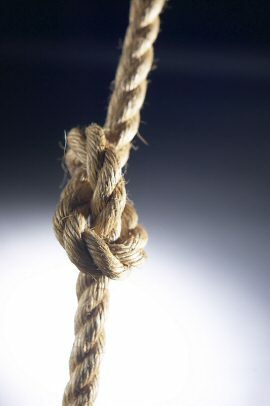 At the tying of the last (ninth) knot, all the energy is directed into the cord and its knots, with a final visualization of the object of the work. The power has been raised and is now "stored" in these knots in the cord. When you feel the spell has done its work, release the knots one at a time for nine consecutive days. They must be released in the same order in which they were tied, NOT the reverse order. Very informational and helpful for me. Thank you Maggie/Astrid/Astridestella :) Brightest Blessings!